1. Taking traditional lamp design, it's very simple and easy to install or replace. 2. The lamp body is light and beautiful. 3. Aviation aluminum that's good heat effect. 4. High light transmitting PC cover. 5. Epistar SMD2835 LED chip. 6. Can choose a variety of lamp length: 0.3m, 0.6m, 0.9m, 1.2m, 1.5m. 7. 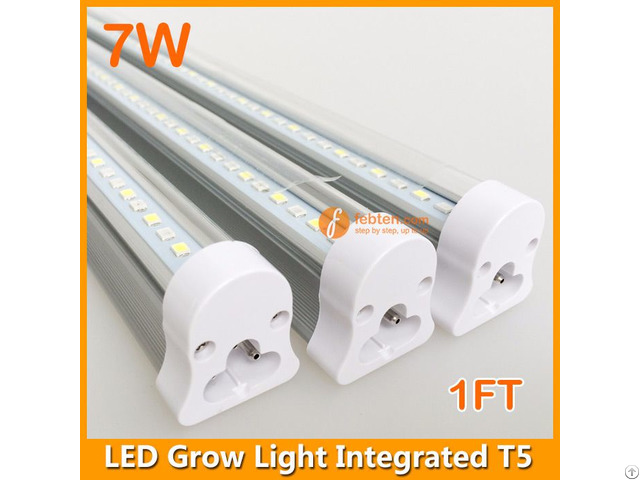 LED grow tube light type with T5 G5, T5 integration, T8 G13, T8 integration. 8. It can be fixed installation, also can choose suspension wire hanging installation. The light ration can be specified by customers, red:blue in 7: 1 suits for vegetables, 5: 1 suits for flower or grasses, 3: 1 suits for fruits. LED integrated T5 grow light can do light ration in 1:1, 2:1, 3:1, 5:1, 7:1 etc. Also can add white lighting if required. LED wavelength also can be specified by customers, red lighting promotes plants to sprout and flower, blue lighting promotes plants to grow up, customers can choose the most suitable wavelength and light ration to promote plants growth. Generally default: red lighting wavelength 620-630nm, blue lighting wavelength 450-460nm, white lighting 6000K-6500K. Posted By: Febten manufacturing Co.,ltd. Business Description: Shenzhen Febten Technology Co.,Ltd. specializes in providing innovative high technology LED lighting production and selling. Exporting to worldwide over 100 countries and area. Owing the principle of integrity to be fundamental and customers to be first. Providing comprehensive, top quality and high efficient LED lighting solution. Building energy saving and green healthy environment life. We have an honest, professional and experienced team. Strictly performing quality system on products, from materials procurement, production, quality inspection to product transportation. Concentrating on all details. Also providing new products development customize and technology support. Basing on talent, quality and efficiency to meet each customer's specific requirements. Highly recognized by domestic and foreign customers' support. Company adheres consistently the operation principle of "Eco-environment Protection and Green Lighting". Under R&D group's unremitting efforts, developed over hundreds of product series which including Tube LED grow light, UFO LED grow light, Noah LED grow light, Par LED grow light, Panel LED grow light, Linear LED grow light, Apollo LED grow light etc. Widely used in indoor and outdoor lighting.